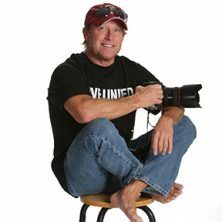 Kirk Schlea has photographed U.S. Presidents, CEO’s, professional athletes, major sporting events, medical operations, exotic locales, and even underwater hockey. He was chosen as one of six photographers worldwide to cover the 1992 America’s Cup sailing races for the Official Record Book and the Stars & Stripes America’s Cup Book. He has shot editorial, advertising, and corporate work for clients such as Pepsi, Cadillac, Mead & Hunt, Farmers National Bank, and Panini America, Inc.. Magazine and newspaper credits include Sports Illustrated, Time, San Diego Magazine, Keeneland Magazine, The Blood-Horse, USA Today, the Los Angeles Times,the San Diego Union-Tribune, and the Lexington Herald-Leader to name a few of over 200 that have published his photographs.